What does this mean for the longest-running American scripted primetime series ever? I got started on this topic with the intention of finding out just what portion of the writing staff for The Simpsons had attended or graduated from Ivy League colleges. 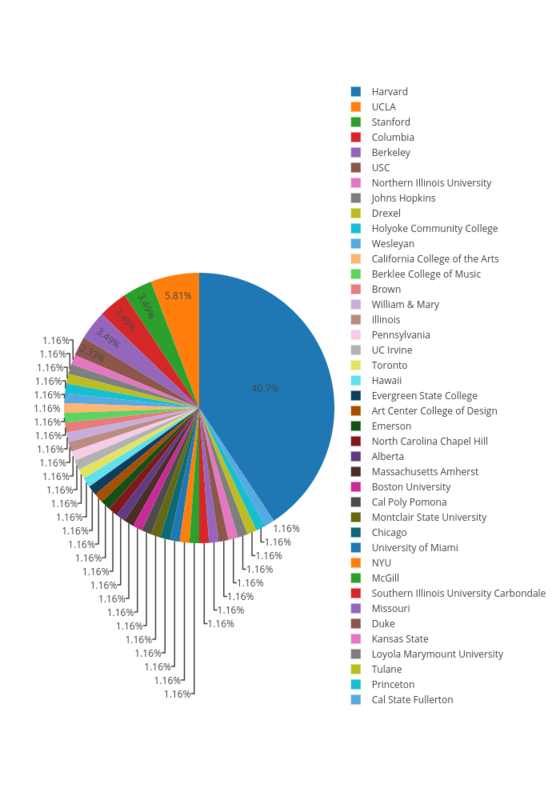 Of the 86 Simpsons writers for whom alma mater data is available, it turns out that exactly half (43) attended an Ivy. Even more striking, however, is the number of writers who have attended Harvard specifically: 35. That's more than 40%. Even in a group of world-renowned astrophysicists or Classicists, that proportion would be high. In a group of TV writers, it's worth a deeper look. Here you can see the breakdowns of all the colleges that Simpsons writers have attended. 5 writers from UCLA, 3 from Stanford, 3 from Columbia, 3 from Berkeley, and 2 from USC. No other school has sent more than one alumni to write for OFF (that's “our favorite family,” super-fan speak for The Simpsons). And this one lumps all the writers who didn't attend Harvard into a single group. That's a lot of people who “went to school in Boston…er, Cambridge.” These Harvard alumni have been making an outsized impact on the series. Pulling user ratings from IMDB, the average score (on a scale of 10) for all episodes in the series is 7.36, whereas the average score for all the episodes of which at least one writer attended Harvard is 7.41. 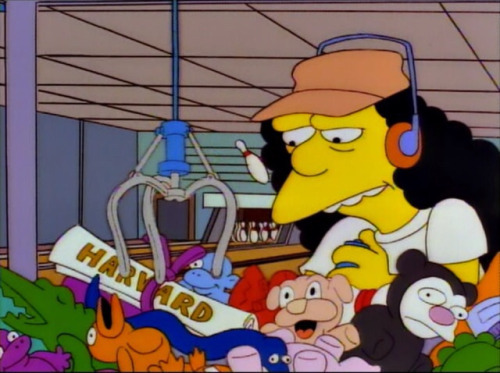 Case closed; Harvard has made a positive impact on The Simpsons. Not so fast. The data are a little less neat than they would appear. Take this tidbit for instance: while the average episode score is higher overall for episodes written by Harvard alumni, this is true on a season-by-season basis only 15 out of 27 times. In 12 seasons, the Harvard average is actually lower than the overall average. Let's ask some more questions. Has the number of Harvard-alumni-penned episodes remained constant? No, not at all. Season 19 saw an all-time low of 4 episodes written by Harvard alumni, while the all-time high of 12 has been hit in 6 different seasons. Here's a season-by-season bar graph of the number of episodes that credit at least one Harvard alumni as a writer. At a glance, these numbers seem to be all over the place. There is one trend, however, that is definitely worth pointing out: the number peaked at 12 in seasons 3, 4, 6, 7, and 8. 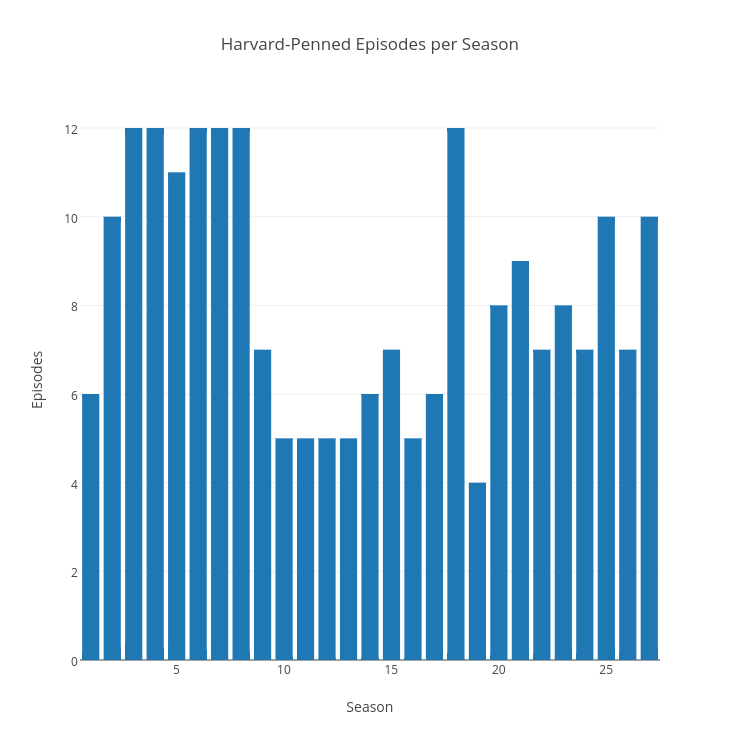 There were 12 Harvard-written episodes in season 18 too, but for now we're looking at that sharp drop in season 9, when there were only 7 episodes written by Harvard alumni. That number dropped again in season 10, from 7 to 5, never getting past 7 again until season 18. As any big-time fan of The Simpsons will tell you, season 9 and season 10 ushered in the “Scully years,” during which the plots became zanier and the jokes less clever. It is probably worth mentioning that during seasons 7 and 8, the show was helmed by Bill Oakley, who attended Harvard, and Josh Weinstein, who attended Stanford but earned honorary membership in the Harvard Lampoon for his summer work on the publication. Mike Scully, on the other hand, never graduated from college, attending Holyoke Community College for a single day before dropping out. Here's the same bar graph as before, the “golden years” (seasons 2 through 8) shaded in yellow and the Scully years shaded in red for clarity. Let's look at IMDB's episode score data a little more closely now. 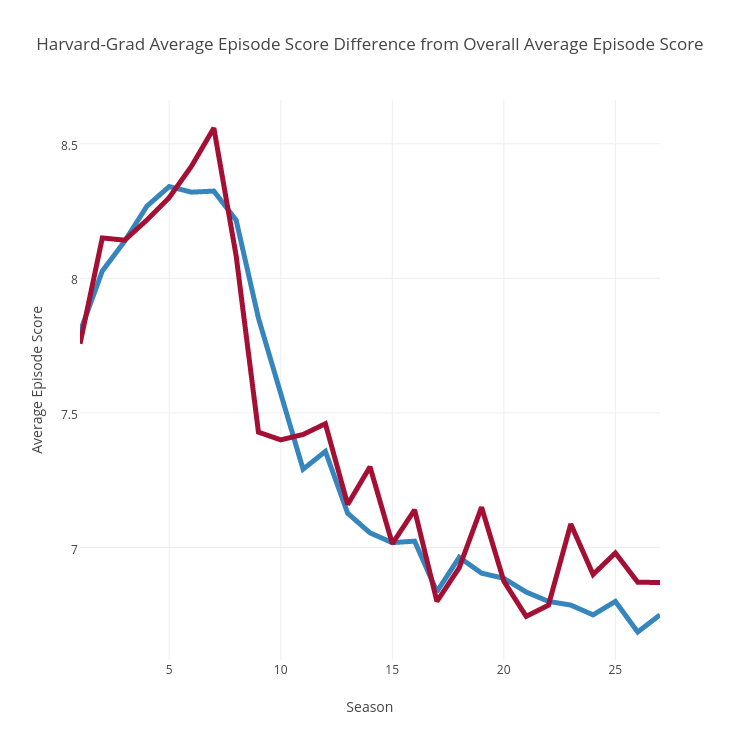 To start, here's a line graph that compares by season the overall average episode scores to the Harvard-alumni-only average episode scores, the blue line representing the overall scores and the crimson line representing the Harvard-only scores. We know that Harvard writers bring the average of the series up but that they also bring the season average down around 44% of the time. Still, the positive difference is significant: when Harvard grads underperform, they do so by a margin of 0.087, and when they outperform the average, they do so by a margin of 0.151. Here's a season-by-season visualization of these data. Here, it is worth mentioning that the Harvard writers underperformed to the greatest degree in season 9, scoring an average of just 7.43, compared to the overall season average of 7.85. As we know, season 9 was the first season that Mike Scully took over; it was also the first time since season 1 that the average episode score dipped below an 8. It is worth mentioning too that since season 10, there has been no negative difference for the Harvard alumni's average scores larger than 0.090. 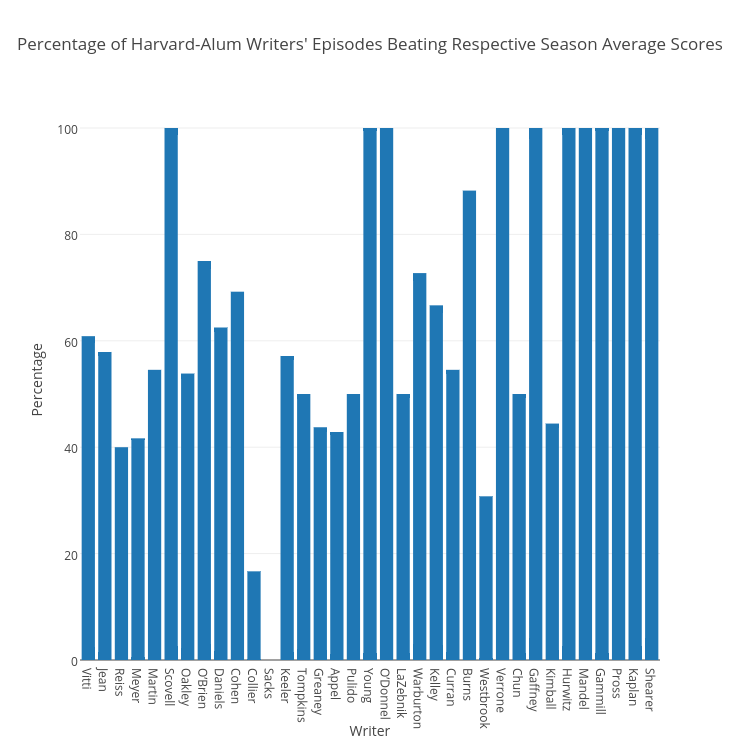 In fact, the Harvard writers have beaten the overall average scores with much greater consistency in recent years than ever before, winning a positive difference in seasons 23 to 27, the longest streak ever. 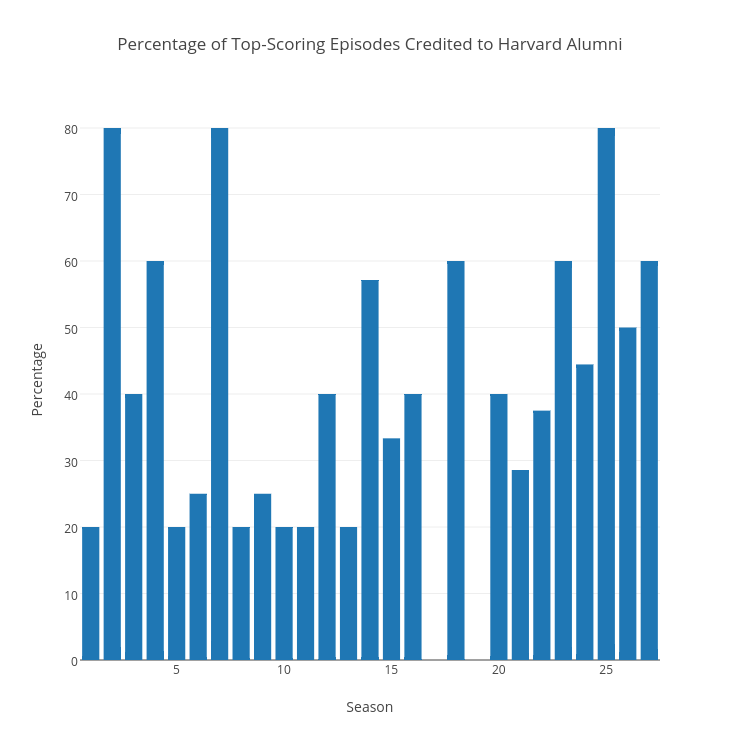 The writing for the majority of the top-scoring episodes (“top-scoring” here defined as the top 5 scores) has been credited to Harvard alumni in only eight seasons. In fact, in two seasons, none of the top-scoring episodes were penned by anyone who attended Harvard. Does a Harvard alumnus showrunner impact the scores in any way? No, not apparently. Al Jean, who has served as showrunner or co-showrunner for 17 of 27 seasons, is a Harvard alumnus. He brought the show into the golden years alongside Mike Reiss, led it out of the Scully years, and continues to helm it today. Bill Oakley, as mentioned previously, is also an alumnus, and he ran the show during seasons 7 and 8 alongside Josh Weinstein. 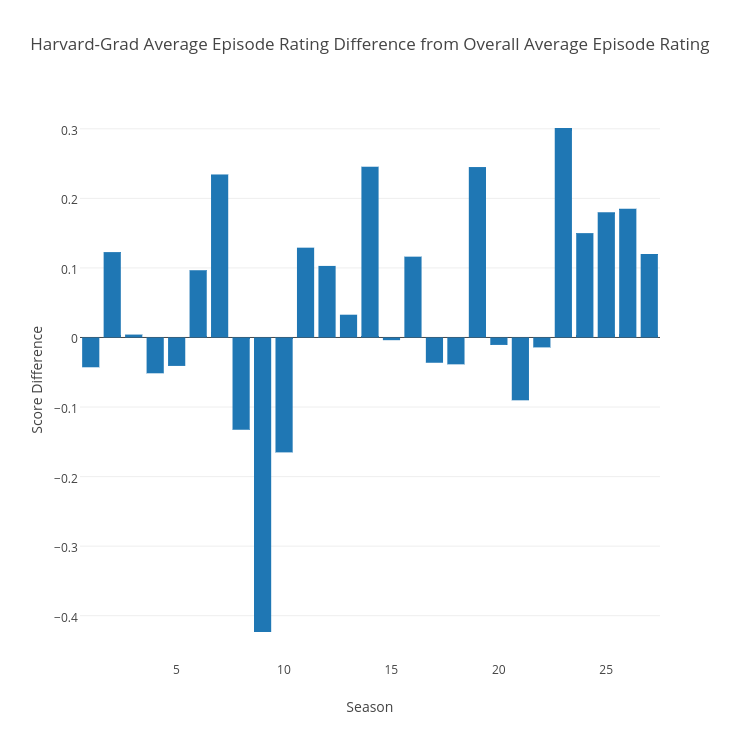 The Harvard alumni beat the overall average episode score in 11 of 19 seasons headed by fellow Harvardians, a percentage that is basically identical to the overall 15-of-27. We've looked at a lot of these data on a season-by-season basis. Now let's look at the individual writers. Of the 35 Harvard-alum writers, 18 have scored averages that are above the series average. This is probably not the fairest way to judge the individual writers, however, since those who score below the overall series average are clearly for the most part just the ones who are writing during the later, less popular seasons. Instead, we should be comparing each episode to its respective season average and seeing how often each writer comes out on top by that measure. 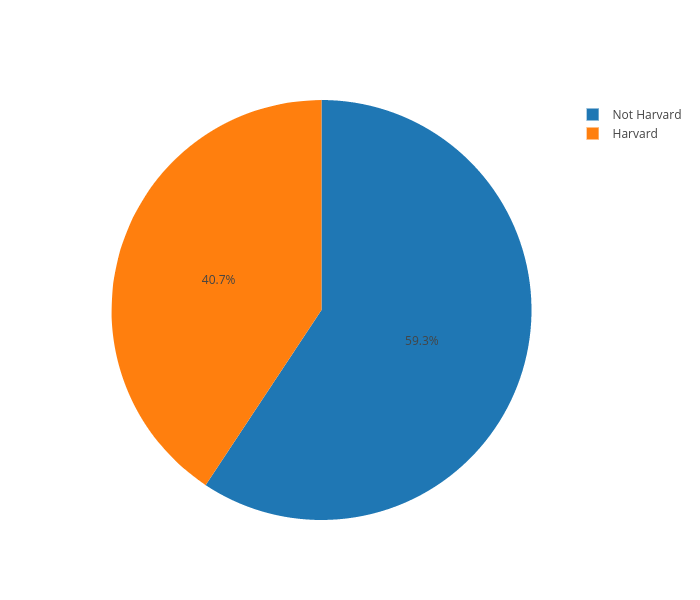 Here's a graph of those percentages. In the more recent seasons, yes, Harvard writers have routinely beaten their season averages. Of eight one-episode writers working primarily in the later seasons, every single one beat their respective season's average. J. Stewart Burns, one of the most prolific writers of the entire series and one who came on board in only the 14th season, has beaten his season averages 14 times in 19 attempts. Looking back, there is also one more thing to consider: in season 18, the number of Harvard-penned episodes spiked back up to 12, and that same season is the highest-scoring season of any between 17 and 27. The competition, it seems, was just that stiff during the golden years. During this period, there were Harvard alumni who became stars writing for the show, producing a huge number of classic episodes, but there were non-alumni producing huge numbers of classic episodes in those seasons as well. In the later seasons, however, it has become more difficult, in terms of fans' scores at least, to deny the existence of a Harvard advantage, as it has become more of the standard for the alumni to beat out their non-alumni peers. @bingeclock That was an incredible amount of research! Thank you!